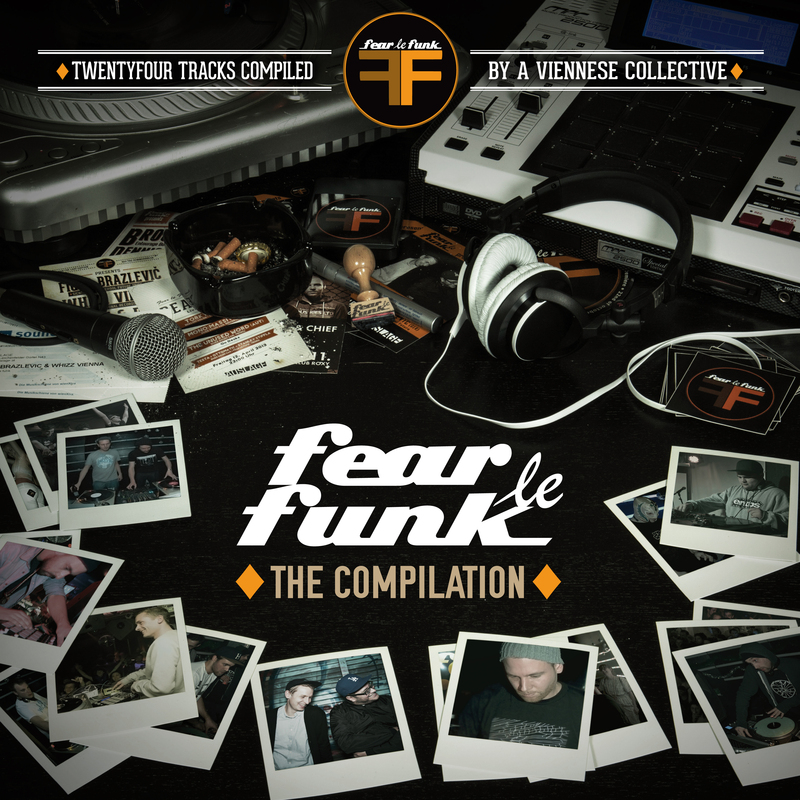 Time has come: the first release of Fear le Funk, “Fear le Funk – The Compilation” (Various Artists) is out now! 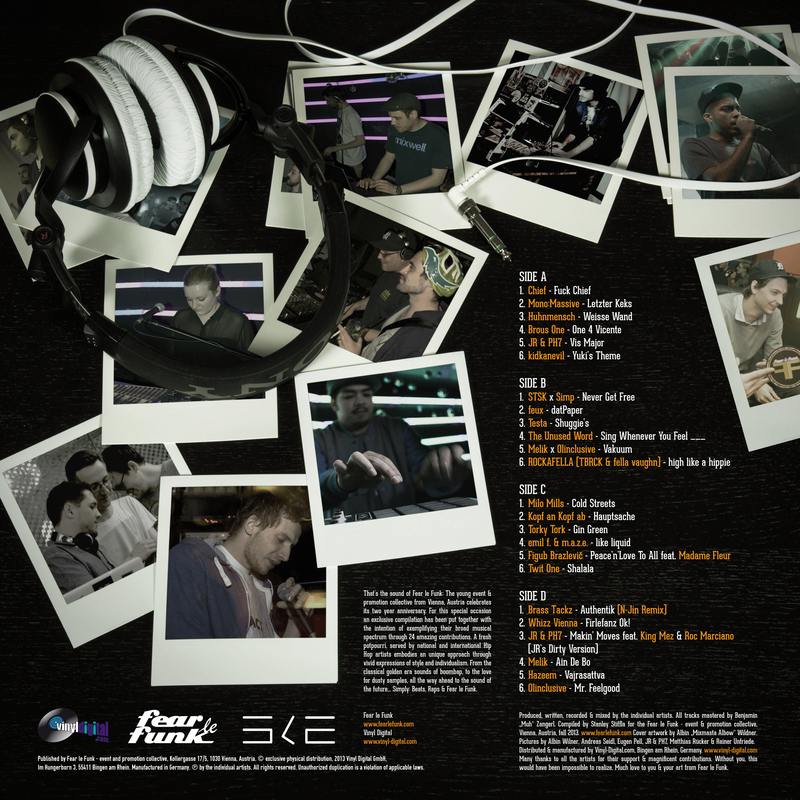 The compilation consists of 24 tracks from more than 20 Austrian & international artists (such as Brous One, Chief, Figub Brazlevič, kidkanevil, JR & PH7, Twit One as well as DustyCrates, feux, Mono:Massive, Shawn The Savage Kid, Whizz Vienna and many more), which were guests of Fear le Funk in Vienna over the past 2 years, since October 2011. The Compilation releases as a 300 limited double-LP vinyl through Vinyl-Digital.com, as well as digital via Bandcamp, iTunes, Amazon MP3, Juno Download & Google Play. Releasedate: December 21, 2013. Following all the purchase options, as well as some further information about the release. That‘s the sound of Fear le Funk: The young event & promotion collective from Vienna, Austria celebrates its two year anniversary. For this special occasion an exclusive compilation has been put together with the intention of exemplifying their broad musical spectrum through 24 amazing contributions. A fresh potpourri, served by national and international Hip Hop artists embodies an unique approach through vivid expressions of style and individualism. From the classical golden era sounds of boombap, to the love for dusty samples, all the way ahead to the sound of the future. Simply: Beats, Raps & Fear le Funk. 20. Whizz Vienna – Firlefanz Ok! Mixmasta Albow, Stanley Stiffla, Ottomatic & Zuzee via Soundcloud. All tracks produced, written, recorded & mixed by the individual artists. All tracks mastered by Benjamin “Muh” Zangerl. Compiled by Stanley Stiffla for the Fear le Funk – event & promotion collective, Vienna, Austria, fall 2013. Cover artwork by Albin “Mixmasta Albow” Wildner. Pictures by Albin Wildner, Andreas Seidl, Eugen Pell, JR & PH7, Matthias Rücker & Rainer Unfriede. Many thanks to all the artists for their support & magnificent contributions. Without you, this would have been impossible to realize. Much love to you & your art from Fear le Funk. Spread the word, support & purchase right now! One love.